Microeconomics: A Critical Companion offers students a clear and concise exposition of mainstream microeconomics from a heterodox perspective. Covering topics from consumer and producer theory to general equilibrium to perfect competition, it sets the emergence and evolution of microeconomics in both its historical and interdisciplinary context. 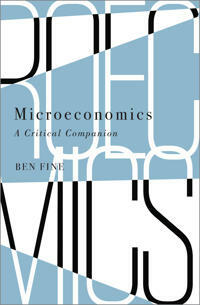 From the culmination of 40 years of teaching, research and policy advice on political economy, Ben Fine critically exposes the methodological and conceptual content of dominant microeconomic models without sacrificing the technical detail required for those completing a first degree in economics or entering postgraduate study. The result is a book which is sure to establish a strong presence on undergraduate reading lists and in comparative literature on the subject.